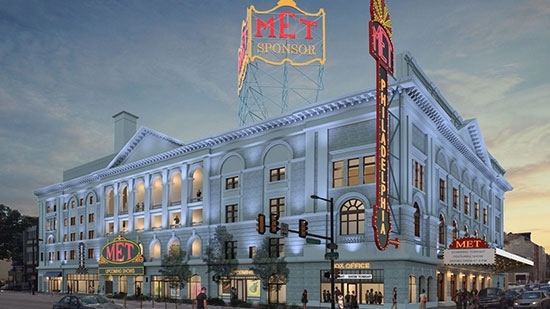 The initial schedule for the Met Philadelphia was announced on Monday afternoon, 9/10, at a press conference held at the Divine Lorraine Hotel. Bob Dylan will headline on December 3rd for the first performance of the renovated concert hall. The $56 million renovation is nearing completion. It is a partnership with Live Nation, Eric Blumenfeld, and Holy Ghost Headquarters. The building is located on North Broad Street at Popular and takes up nearly an entire city block. It was built in 1908 by *Oscar Hammerstein I and called the Metropolitan Opera House. Over the years the building hosted the Philadelphia Opera Company, concerts, movies, boxing, basketball, theater, the circus, and church services. It was known worldwide for its superb acoustics and was used by the Philadelphia Orchestra as a recording hall. The 39,000 square foot building will seat between 2,200 and 3,500 people. The initial schedule includes a variety of entertainment including the folk legend, alternative rock, r&b, hip hop, indie rock, comedy, jazz, bluegrass, and dance. Philadelphia artists include PnB Rock, Ween, Kurt Vile, and Amos Lee billed as part of the #hoMETownSHOW series.